Weight 146.2 (Up 0.6lbs from last week). This fluctuating weight is getting on my nerves. Anyway, I want to talk today about my new weight-lifting routine! Yup, this girl is lifting weights and feeling the burn!! I have wanted to build some muscle for awhile now, but I get so overwhelmed in the weights room because I simply didn't know how to work the couple machines we have, and I didn't know enough free weight exercises to effectively use the dumbbells. Thus, I began my search for a beginners weight lifting routine. However, every program I came across was suggesting exercises that required equipment I didn't have access to or exercises I didn't know how to do and it was confusing! I began to look into apps and finally came across the perfect one- Jefit. 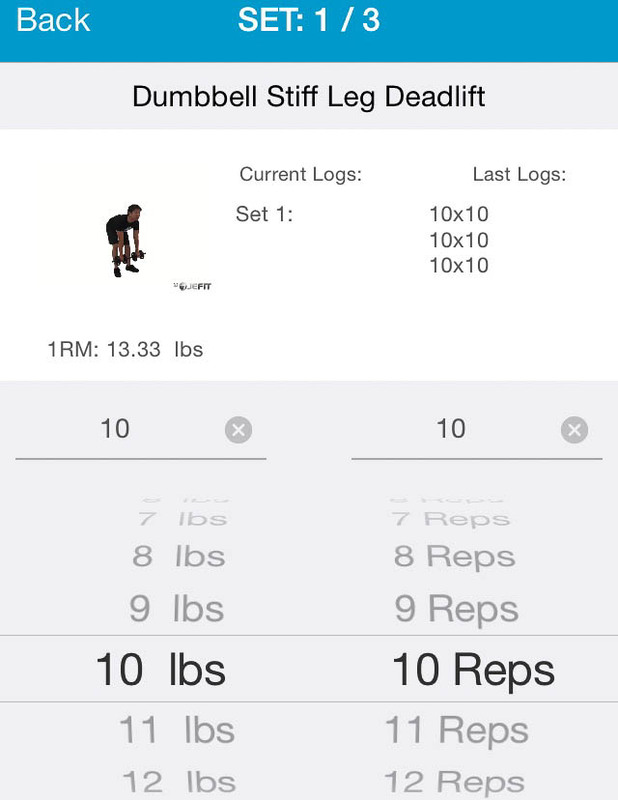 This app actually offered a weight lifting regimen that was dumbbells only, which is perfect for me! Once you sign up and give your details, you can pick from a list of various workout regimens for various levels and commitments (I am on Dumbell-Only Full Body home Workout, which is 3 days a week). You can also just make your own schedule and it has tons of exercises for various muscle groups. 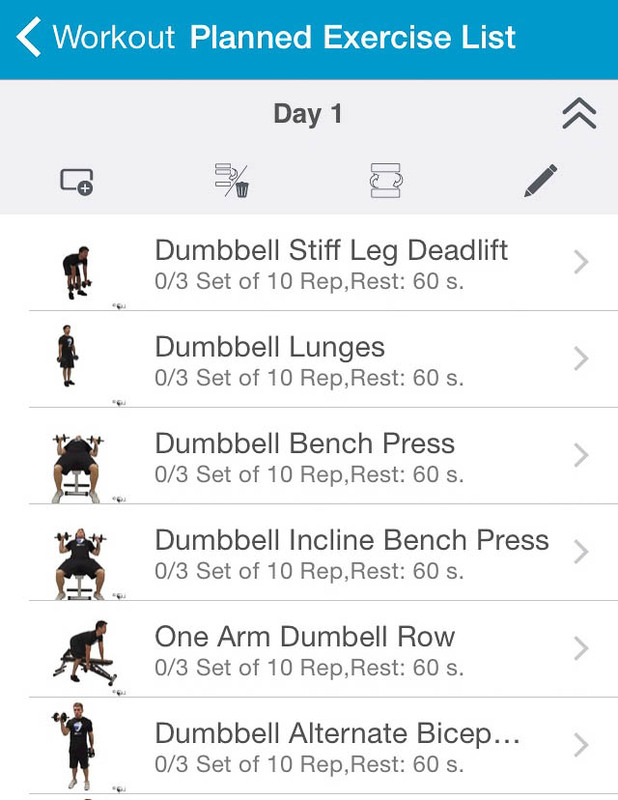 Each day you open "today's" workout and it gives you a whole list of exercises to do. The idea is to do 3 sets of each exercise and each set is 10 reps, although you do have the option to do less reps once you are in an exercise. Here is where you log in the weights and number of reps you have done. You can change it up for each set and you can see what you did last time you did this exercise, which will help you slowly try to increase weights when it becomes too easy. If you don't know how to do the move, you just tap on the little guy in the upper left corner and you will see a gif of him completing the move and then also instructions on how to complete it and proper form. You also have the option to time yourself while completing the move. I tend to skip this. Once you have completed an exercise, it takes you right on to the next one, which is a feature I really like because I can take each move as they come and I never really know when my workout is over. I am working really hard at doing each move nice and slow and holding for a count each time. It is much harder that way! Right now I seem to be moving through a workout (which is around 10-12 different exercises) in about 35 minutes. Once my muscles stop screaming in pain from all this new usage, I am hoping to run and do my three dumbbell training sessions, but for this past week I only did the dumbbells and wow am I sore! I just thought I would share this app today, as I am really enjoying it! Let's hope I stick with it and get some sweet muscles!